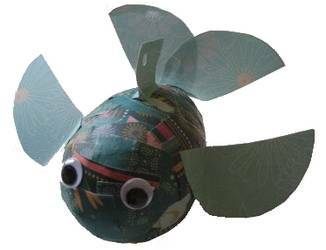 Make a shoal of pretty papier mache fish using balloons as the base, covered with paper strips dipped in a simple papier mache paste recipe. Bring 2 cups of water to a boil. In a bowl, combine flour with 2 cups cold water. Add this mixture to the boiling water and bring to a boil again. Remove from heat and stir in sugar. 1. Cut lots of paper strips and place them in a bowl for easy retrieval. 2. Pour the papier mache paste into a wide, shallow bowl. 3. Blow up the balloons and begin applying the paper strips. 4. Cover the balloon completely with several layers of paper strips. 5. Hang the papier mache fish from a coat hanger and leave to dry overnight, or until fish is completely dry. 6. Pop the balloon and add the finishing details. Use a drinking glass or another circle template to cut circles from the patterned paper. Cut the circles in half and glue in place as the fins and tail of the fish. 7. Glue the plastic, googly eyes into place. 8. Punch a hole at the top of the dorsal fin and tie on a piece of fishing line. Hang from the fish line in your bedroom. Enjoy your colorful flying fish! Thanks to the girls (and mom) from Flipflop and Applesauce for showing us how to make papier mache fish!